I’ve been so excited about today’s post! Rachael from Imagine Gnats challenged April, Brooke, and I to a super fun challenge. 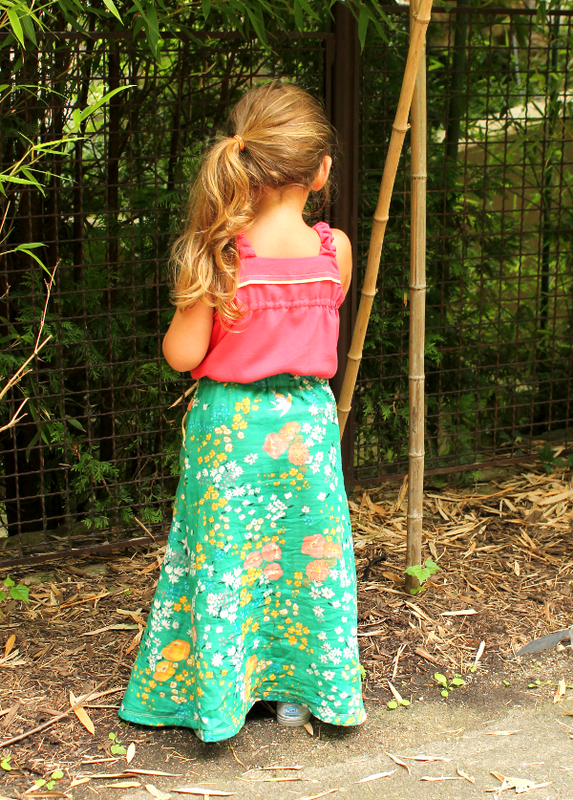 We were sent the same Nani IRO En Garden fabric (*affiliate link) to make anything we’d like and then were pitted against one another in a sort of “who sewed it best” competition. I’m always up for a friendly competition and was drooling over the fabric she chose, so of course I jumped right in. 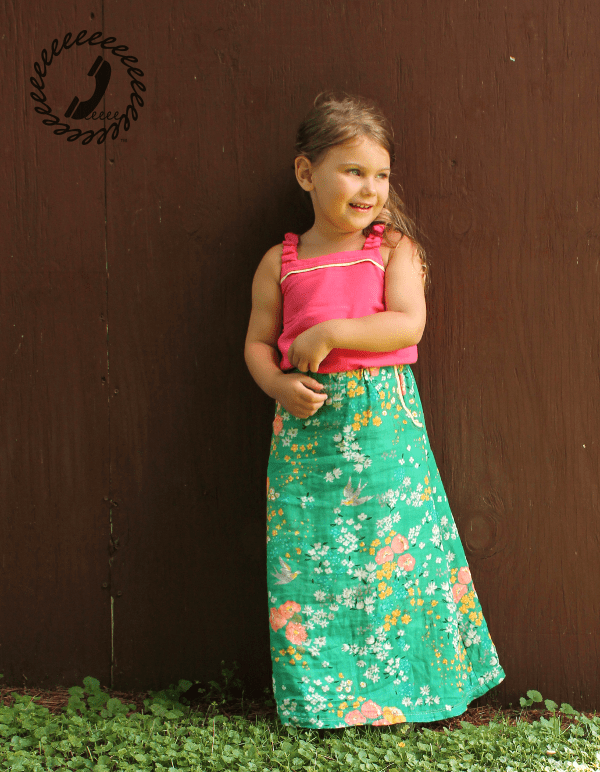 Is anyone shocked I made a Paneled Sunsuit Maxi Dress (view C in the pattern)? 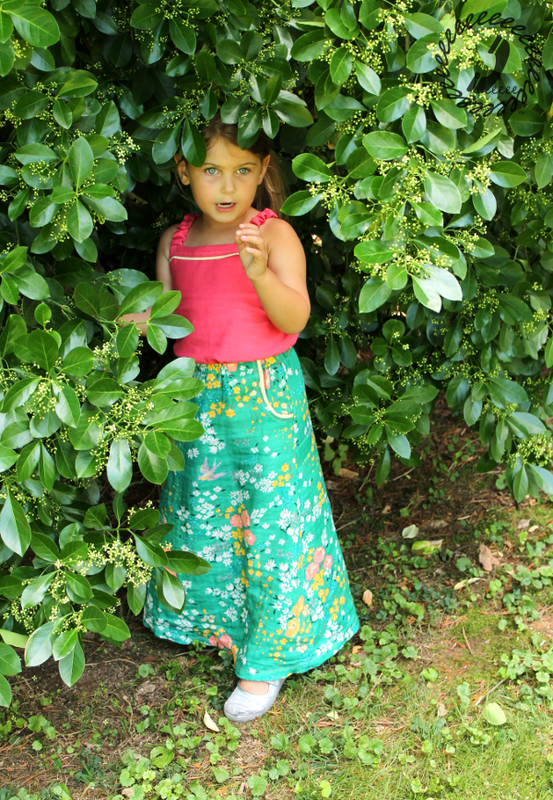 Well when the Nani IRO En Garden fabric arrived, I planned to make a skirt for myself since it was so dreamy, but then Bean saw it and said she loved the flowers and “ooh the birds too” so I changed plans accordingly. 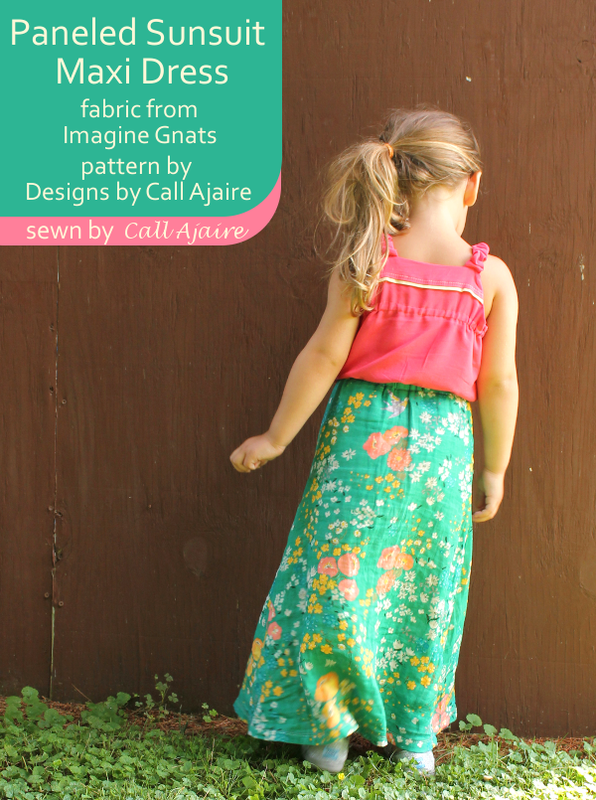 All of the fabrics in this maxi dress are from Imagine Gnats. Even the 1/4″ elastic I used in the straps and back bodice were from the shop. Have you visited her shop lately? It’s so full of goodness, including a whole new selection of notions! The bodice fabric is a rayon challis (*affiliate link) in coral which is just the perfect summer fabric. The drape is lovely and with the maxi dress bodice fully lined, the double layer of challis means it isn’t sheer at all. The faux piping pockets and flat piping at the bodice panels are made with an interweave cotton in a butter color which is no longer available, but there are even nicer, yet similar artisan cottons available (*affiliate link). We had friends in town so we went to the zoo and it was incredibly hot so Bean was sweating in most of the pictures we took that day. The challis was still so nice by the end of the day and I noticed it never was clingy nor did it add to the heat so I will definitely get some more to make a top for myself. 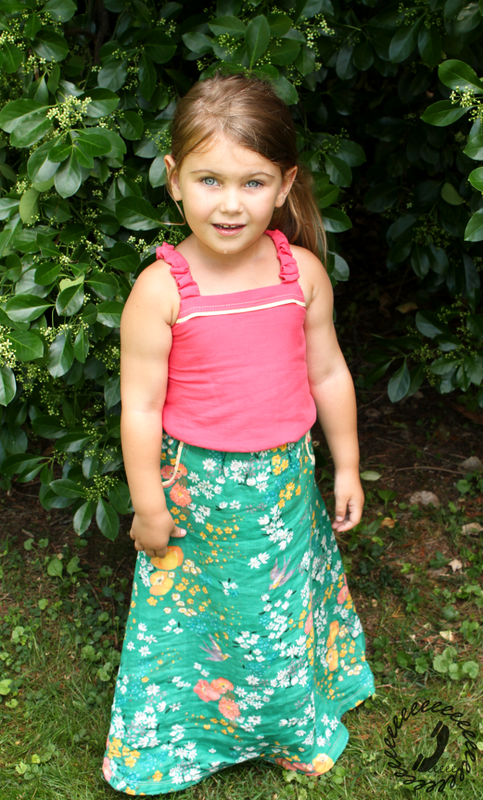 I love how these bodice colors work together with the gorgeous colors in the En Garden fabric. I even used coral and butter colored threads in the cover stitching to add a little more accent to the dress. 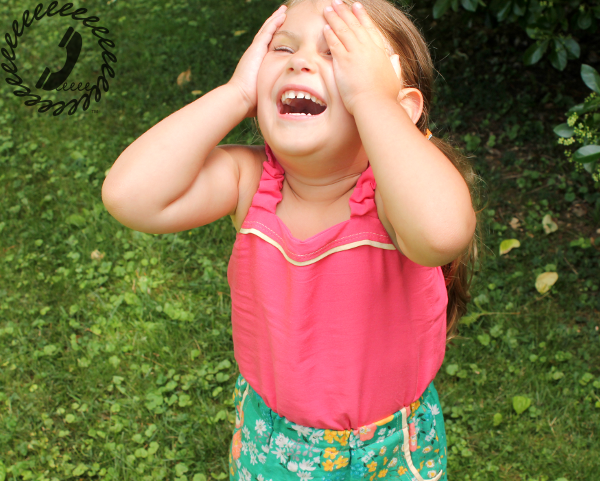 When we got back from the zoo we took a few more pictures in our yard and Bean was being completely silly. Here she was explaining how she was a tiger sneaking out of the bushes. Earlier we had seen the tigers hanging out in their moat just to keep cool and you know it’s hot when even the cats are swimming. I think the heat may have gone to her head a little, but she had fun jumping in and out of the bushes, hehe. 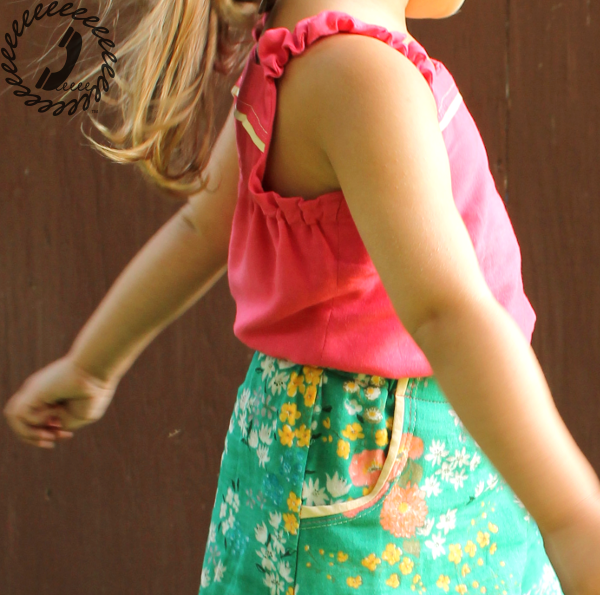 If you want to find out more about the Paneled Sunsuit pattern (where to purchase and to see some of the other views), click here. And now, if you haven’s seen what the other ladies made for the challenge yet, head over to Imagine Gnats to check it out! This particular colorway of the En Garden fabric is out of stock (more has been ordered though!! ), but there are two others available that are just as lovely. The one with the blues and white (*affiliate link) might be calling my name.